There’s not much action in Star Wars #63, and a whole lot of talking, but at least the artwork looks good. Leia’s plan to attack Shu-Torun shifts into gear as they reveal the final details of the plan and start carrying them out. It ends before they get too deep into the action, thus serving as more of a bridge for the overall plot than a satisfying story of its own. The issue opens with Queen Trios talking with Commander Kanchar, who we haven’t seen in a while. He’s the hulking, bald, gray beard dude with an eye patch and a robot arm. 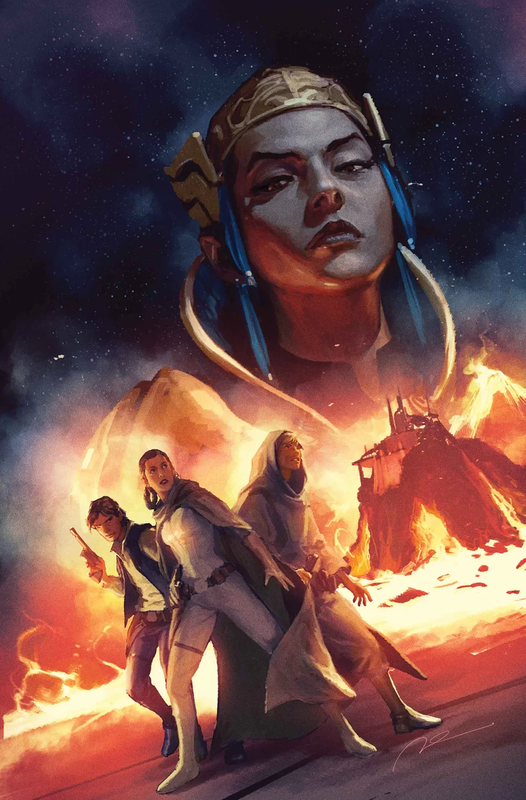 They chit chat, talk about Vader and the Empire and not complaining, and Trios kind of forcefully dumps on to the readers what the spike is and how it’s so central to her world and how it works. The story then shifts to Leia and how she’s going to blow it up. The Rebels go over their plan, the mechanic lady complains a lot, and then they go kidnap and ore baron. That’s the only action in the issue. Afterwards the shape shifter impersonates the ore baron, C-3PO scans Queen Trios’ eye, and their off with phase two of Leia’s plan. But not before she forces the shape shifter to say something to Trios, something that was needlessly risky and rather selfish of Leia. The story is okay. Basically things are just moving along. The artwork, however, was really nice. There was some extra special attention to the face work in this issue and the panels looked great. Top notch artwork and coloring. With an okay story, but great artwork, I give this one a three out of five metal bikinis. This isn’t going to be anyone’s favorite issue, and it’s not meant to be one we linger on. Right now, we’re all chasing toward the end.